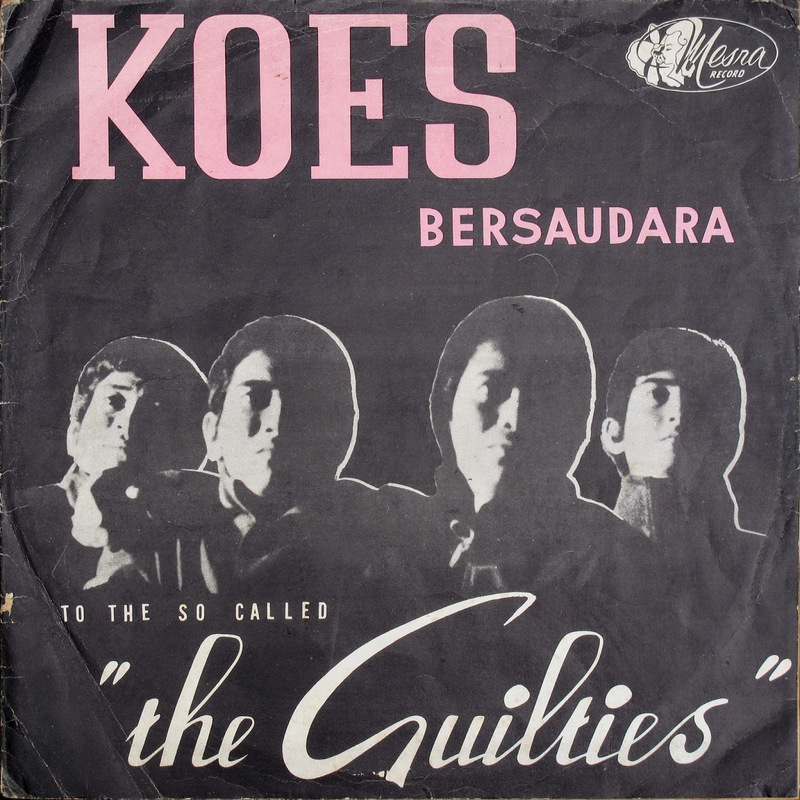 Bands had it hard in Indonesia in the sixties - Koes Bersausara were imprisoned for three months for making western-style rock! After release, into a new regime which was more lenient towards their music, they made the album To The So-Called "The Guilties" (1967). The track 'Poor Clown' is considered to be about ex-President Sukarno, who's old regime was responsible for their imprisonment. 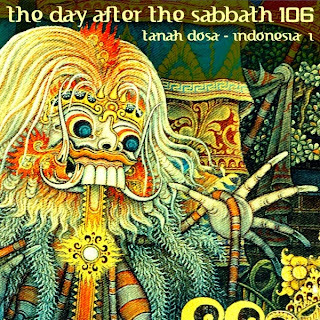 Welcome to volume 106, the first part of my attempt at exposing the early hard rock, psych and prog of Indonesia. For more, check out vol 98 which centered on just one Indonesian band. The cover art is an interpretation of Leyak, "Leyak are said to haunt graveyards, feed on corpses, have power to change themselves into animals, such as pigs, and fly. In normal Leyak form, they are said to have an unusually long tongue and large fangs. In daylight they appear as an ordinary human, but at night their head and entrails break loose from their body and fly." Let's get this cleared up right at beginning, there were very few out-and-out TDATS-heavy bands making records in the '60s and '70s, maybe enough to be counted on one hand and most of them were short-lived; AKA, Shark Move, God Bless, Giant Step and SAS Group are maybe the main contenders. This opinion is of course based only on the bands' recorded output, unfortunately I'll never have the luxury of watching bands such as AKA live, which by all accounts could have been quite an experience with their heavy riffing and late front-man Ucok Harahap's famed stage antics. 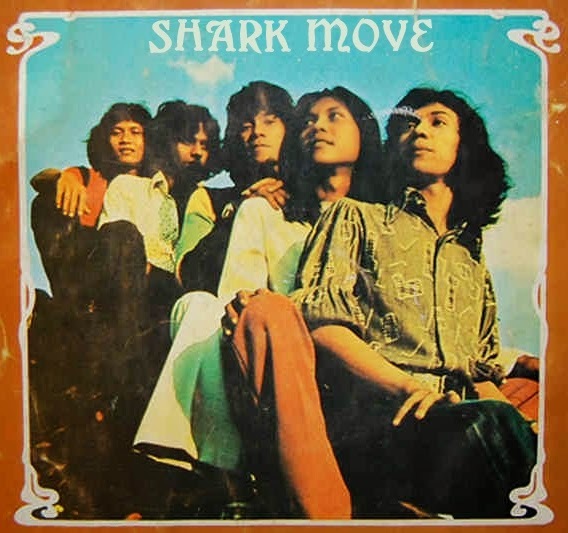 Of all these, Shark Move was probably the most contemporary-minded heavy band (for all of its one album) in Indonesia; they were apparently taking notice of the developments of Deep Purple and Uriah Heep when they were happening. Other bands, while good, seemed a few years behind the sounds of their western inspirations. This is undoubtedly due in part to the restrictive environment for rock, a hang-over from the '60s. A mention must go to Now-Again records' great 2011 compilation "Those Shocking Shaking Days", which is one of the best starting points to find out about Indonesian rock. Also to Strawberry Rains' awesome AKA retrospective "AKA: Hard Beat". Hearing "Do What You Like" from this was one of the inspirations for making some Indonesian comps. 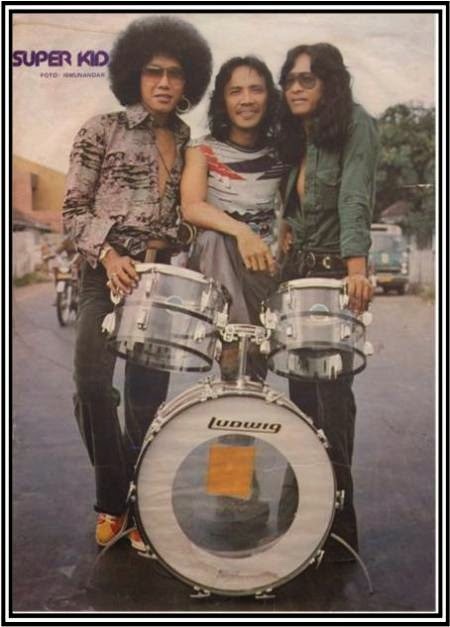 from album "Vol 4: Duo Kribo original soundtrack"
from album "Volume 2: Ikhlas"
from album "Pahlawan Yang Dilupakan"
from album "Donny and the Road"
from album "Volume 2 : Senyum Harapan"
AKA, from Surabaya, East Java, made some fantastically heavy tracks from 1970 onward, but never made a heavy album. The feeling pervades that some bands operated like a production line, knocking out albums to order. 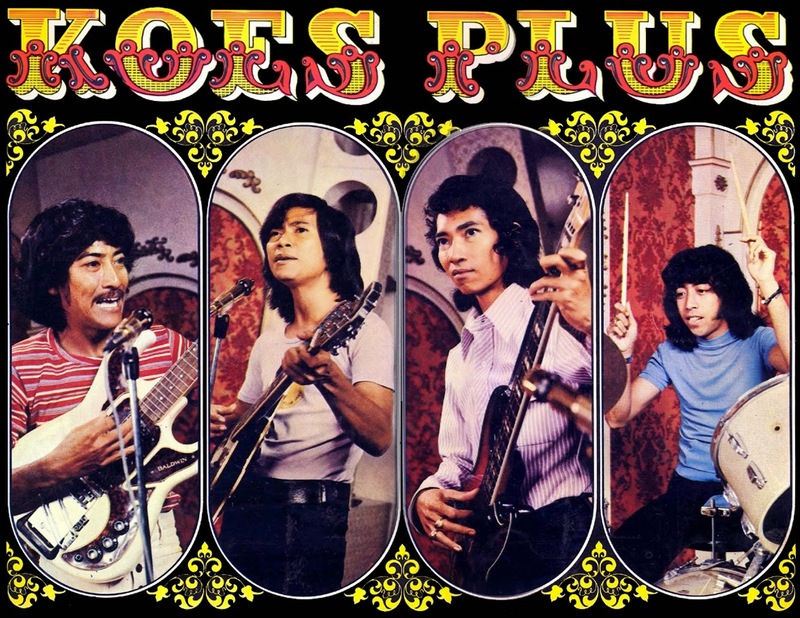 Koes Plus (which is what Koes Bersausara became) for example made about 35 LPs between 1969 and 1980 alone! They often had utilitarian names like "Pop Melayu Vol. 4", "Hard Beat Vol. 2" or merely "Volume 14". Koes Plus would make one album all of a particular style ("Pop Melayu" being pop music in the Malay language and style) and for the next they would concentrate on something different like hard rock, as in the two "Hard Beat" volumes. The afore-mentioned AKA treated their albums in a similar way, they would hedge their bets on record and include a couple of excellent hard rockers along-side what I presume they considered mass-appeal pop songs. This makes for a schizophrenic listening experience indeed! 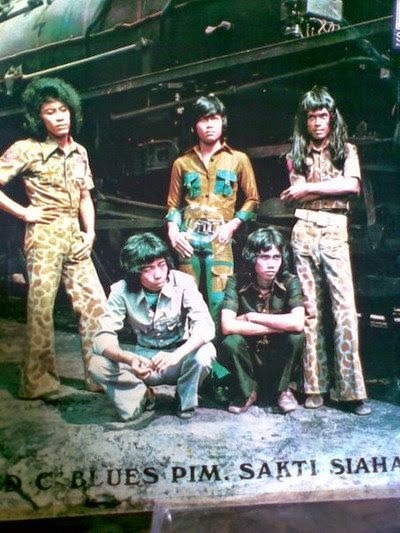 In 1970 AKA made an album entitled "Qasidah Modern" which was entirely in the Qasidah Modern style, at type of Islamic pop based on Arabic religious poetry, which during those times extolled a virtuous life and offered moral advice to teenage pop fans that may otherwise be corrupted by the vices of rock n' roll. The history of hard rock and prog starts with some formative '60s bands, which were the launch pads for many enduring names in Indonesian rock. These included Koes Bersaudara (later known as Koes Plus), The Peels, The Steps and The Rollies. Secluded along-side these is Panber's (made up of the four Pandjaitan brothers), which was probably the most popular band in the country in its heyday, and is still going. Many of the bands mentioned above appear in this volume, and more will be in the next one planned for Indonesia. In the case of pop bands like Koes Plus, Panber's, The Gembell's and The Peels, I have attempted to find the most suitable tracks for your heavy-loving ears, as these bands generally made mellow music. To punctuate the rock I have included some diversions like the all-girl "The Singers", some joyous folk rock from D'lloyd and a psych ballad from C'Blues. 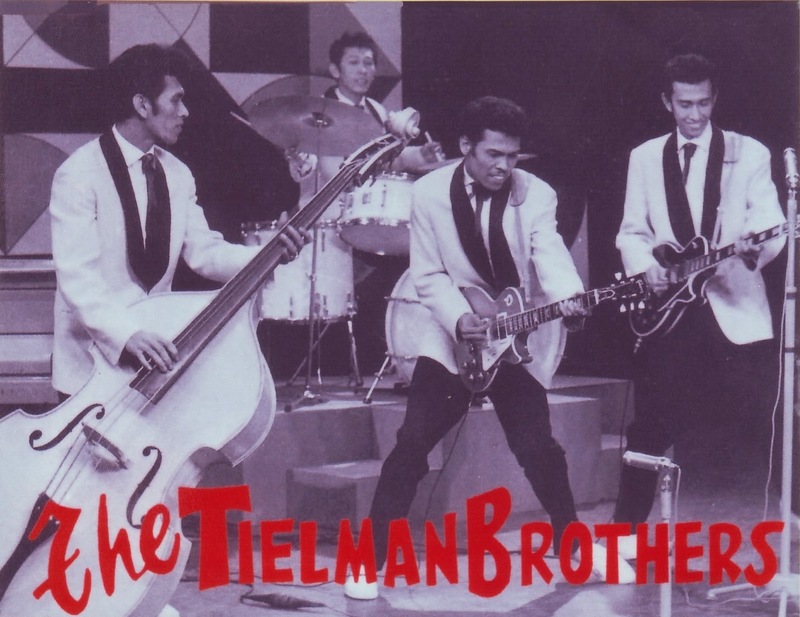 A brief mention goes to The Tielman Brothers, the main instigators of what became known as Indo Rock. Their wild shows with dual guitar pyrotechnics made a big impression in northern Europe. This was rock n' roll played by youngsters of Indonesian descent who's families had re-located to Europe, The Netherlands being one of the main hotbeds due to it's colonial ties with Indonesia. Check out TDATS vol 64 for Dragonfly, some more ex-pat Indonesians in The Netherlands. 01. The comp starts with some real cultural flavour. 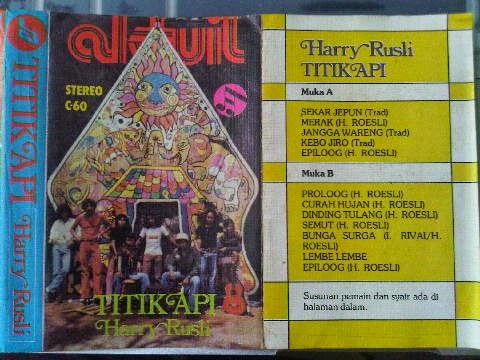 Bandung's Harry Roesli is an important name in progressive rock in Indonesia. He made experimental albums in the '70s, as well as rock albums with The Gang of Harry Rusli. He touched on Dylan-style protest rock and also folk styles, which is demonstrated by the track I used here. On his 1976 solo album "Titik Api" he used a host of traditional instruments, to unique effect on our opening track, Jangga Wareng, a traditional arrangement of Gamelan mixed with prog. Gamelan is Javanese ensemble music which uses mostly gong and xylophone-type percussive instruments. 02. Moving on to Bandung's Shark Move, for some Deep Purple worship of a high order. The band was Benny Soebardja (vocals, lead guitar), Bhagu Ramchand (vocals), Sammy Zakaria (drums, vocals), Janto Diablo (vocals, bass, flute) and Soman Loebis (vocals, keyboards, piano, percussion). Good friends Benny and Soman (who first got together in garage band The Peels) started the band, which recorded the album Ghede Chokra's in 1972 with only 100 vinyls pressed. Later it would be pirated on cassette tape, the main format in idonesia in the later '70s, and re-issued in the 2000's after re-discovery around the globe. It was a truly unique sound for an Indonesian band. Standing out from the sweetly pleasant pop music of the times, it must have been a real blast for anyone first hearing it. Nobody else had recorded anything this advanced or progressively heavy in the country at that point. Tragedy struck soon after the albums' release and Soman was killed in a traffic accident. No doubt very upset, and unable to find a suitable replacement for his keyboard skills, Benny folded the band. Benny then started up Giant Step, which fortunately reprised Shark Move's legacy and became an equally important prog band. 04. D'Lloyd, another band that did not play TDATS type stuff, made a lot of albums. On a quick listen through, I was charmed by this track from their debut album. It begins with some storming flute prog, fuzz guitar, and continues in a melon collie psych arrangement, featuring nice violin and organ. 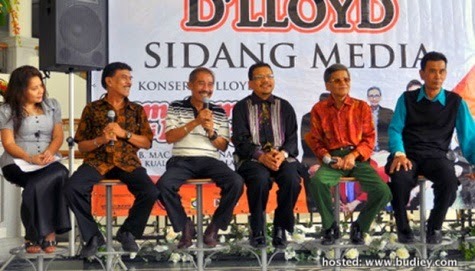 The band is lead by Syamsuar (Sam) Hasyim and they are still around. Some more info here in Indonesian. 05. I have written about Duo Kribo previously in Vol98, which is dedicated to them. 'Duo Kribo' literally means 'frizzy duo', a name which makes sense when you look at both frontmens' wild hairdos. The band made four albums around 1977-79 and had good success, selling many thousands of cassette tapes (the predominant format in Indonesia back then). They are usually referred to as Vol. 1 to 4, though it seems some of them were sub-titled in some formats, with names like "Neraka Jahanam" ("Blasted" or "Savage Hell") and "Pelacur Tua" (Old Whore). The final one was a soundtrack to a rock'n'roll movie called 'Duo Kribo' that starred both singers. The movie was lost for decades but prints have been recently recovered and restored. Duo Kribo was started by singers Ucok Harahap, after he left AKA, and Achmad Albar, who was the front man of God Bless. I have been able to deduce that a lot of the Kribo guitar duties were carried out by Ian Antono of God Bless, but I'm not sure about the rest of the musicians as they are rarely mentioned or credited. 06. The Black Brothers, from Papua Barat, are listed at RYM as Marthy Messet (lead vocals), Sandhy Betay (backing vocals), Hengky MS (guitar), Jochie Phiu (keyboards), Amry Tess (trumpet), David (saxophone), Benny Betay (bass) and Steve MR (drums). 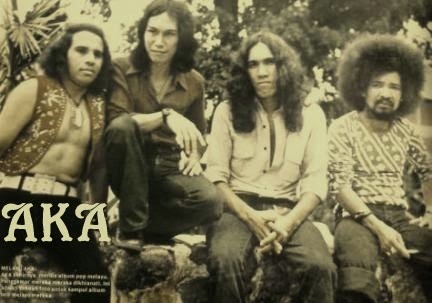 They played mostly pop and Reggae, but this nicely fuzzy rocker is from their 1979 album 'Perdana'. 'Tanah Dosa' means 'Land of Sin' and is sung in Tok Pisin, the language of Papua New Guinea. 07. Following on from Shark Move, Bandung's Giant Step was started in 1972 by Benny Soebardja (guitar). Their sound carried directly on from Shark Move in the vain of Deep Purple-ish heavy prog. 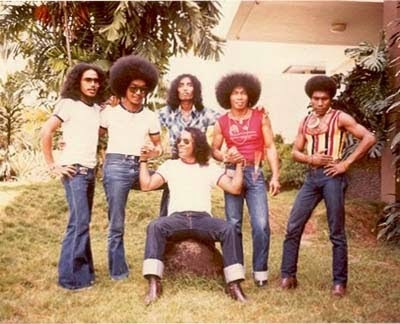 Benny had been in one of Indonesia's early bands, The Peels. They were short-lived, but they were one of the first bands to gain acclaim abroad, in Singapore and Malaysia for instance. 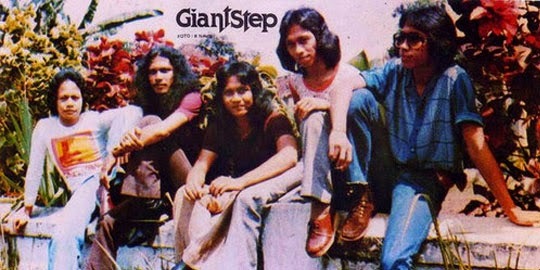 Giant Step had many members through it's 20+ years existence, including previously mentioned names, Dedy Stanzah, (bass, 1971-72), Deddy Dores (keyboards, 1972-76) and Jelly Tobing (drums, 1985-92). The band also included Harry Soebardja (guitar, 1978-85) who I'm guessing was Benny's brother (unconfirmed) and Yockie Suryoprayogo (keyboards, 1971-72) who was a keyboardist of note, playing in God Bless and Contrapunk. He gained more notoriety in the late '70s and '80s, with soundtracks and solo albums. Wikipedia claims that during a low point of drug use in the '70s, Yockie stole and sold a ring belonging to Harry Roesli to fuel his habits. 08. Bandung's C'Blues included Soleh Soegiarto (trumpet) and Utte M. Thahir (bass), who were the founders of Freedom of Rhapsodia soon after. The rest of the band was Adjie Bandy (sax, violin, vibe, vocals), Idang (drums, leader vocals), Mamat (organ, vocals, former band The Comets), Nono (bass, vocals, former band Djoko Dolok) and Bambang (guitar, vocals). Later on Mamat left and Yongky (organ, alto sax, vocals) joined. 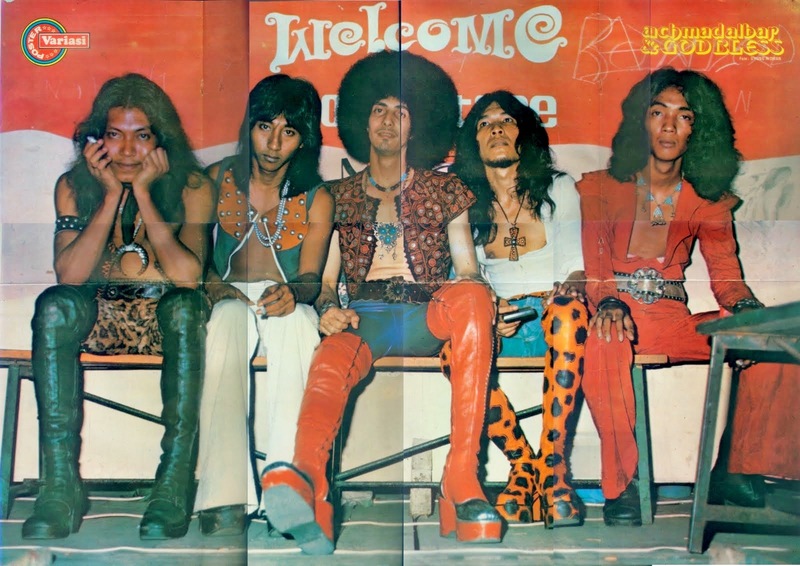 I am trying to find out if 'Yongky' is the afore-mentioned Yockie Suryoprayogo but have been unable to thus far....the hard thing about researching Indonesian bands is the lack of information out there (especially in English), compounded by the fact that multiple spellings are often used for some peoples' names. Violinist Adjie Bandy later formed Contrapunk, a self-proclaimed “bach-rock” symphonic prog group who will probably appear on the next Indonesian comp. C'blues made two albums. Again they are quite mellow affairs, and not serving any heavy nuggets, but I was taken with the track 'Tinggal Kenangan' (Living Memories) from the second LP 'Ikhlas', with its haunting organ work and violin. 09. There are two good tracks on the first album from Surabaya's The Gembell's. These are the two with english names, and "I'm Really Down" is one of them. Unfortunately (for us) these are the two heaviest tracks I could find, over five albums or more, as they pursued a pleasant pop sound. Their name come from an abbreviation of the Indonesian for "Joy of Learning". Having met as students, early on they moved to Singapore and made a name for themselves there. Moving back to their homeland, it is said that the band always used a lot of social comment in their songs. One song called "Peristiwa Kaki Lima" criticized the negative affect that trade and industry was having on the appearance of their once beautiful home city Surabaya, and it was banned from radio. The Gembell's made 10 albums. There is an interview with the band's leader Victor Nasution, here. 10. Deddy Dores was originally a keyboardist but also plays guitar on some of the many albums he's worked on. He was in Giant Step, Superkid, God Bless, Fantastique Goup, Freedom Of Rhapsodia and the Deddy Stanzah band. I found this solo record on Henk Madrotter's extremely cool blog, specialising in Indonesian rarities. I do not know what year it was made, but it sounds like the right time period for TDATS. "9 Tahun" is based on groovy acoustic guitar, with Deddy's vintage synths over the top. 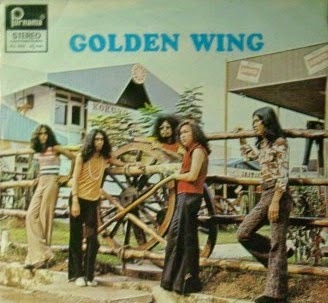 His first solo album was Tinggal Kenangan, released in 1973, with additional band members collectively named "The Road". 11. Benny Soebardja, born 1949 in Tasikmalaya, Jawa Barat, was an important guitarist who started out in The Peels in 1966. This was one of the first bands to get over-seas recognition. His resume also includes Shark Move, Giant Step, and briefly, Fantastique Group. Fantastique Goup was a pop group that made a few albums, and similarly to AKA, made some music in the "Qasidah Modern" style, this being a great one: Allahu Akbar. Benny made three highly sought-after solo records in the '70s, which were independently released. 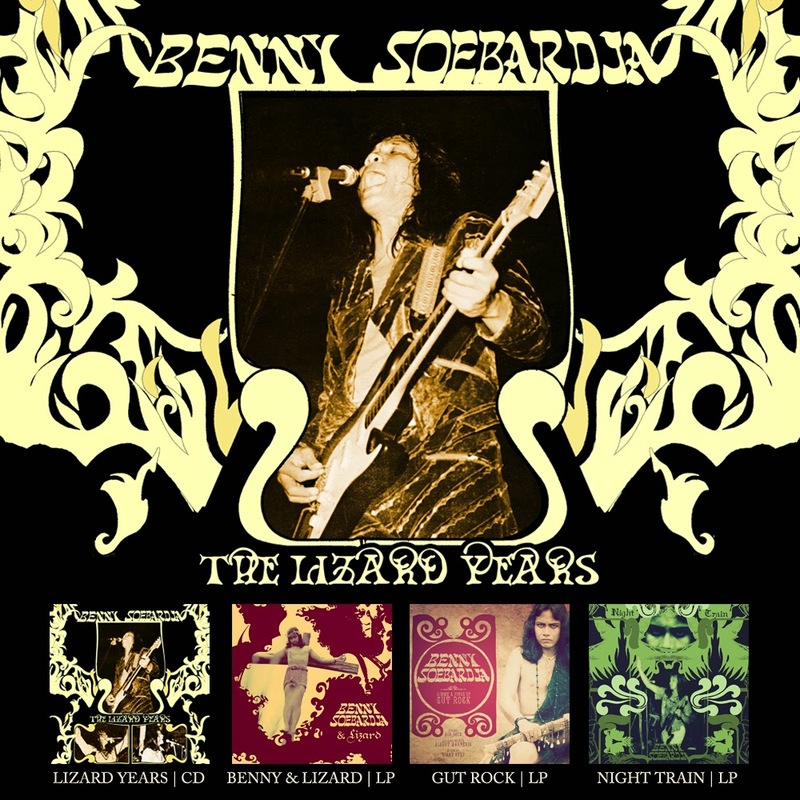 Strawberry Rain has re-issued them all; each album separately, and all together as "Benny Soebardja – The Lizard Years". The Lizard part of the name comes from Benny's backing band, an ensemble which contained members of both Giant Step and Harry Roesli’s Philosophy Gang. Benny had no label influence while recording these offerings, making them true private press recordings, and the spirit of his excellent work with Shark Move and Giant Step pervades it all. 12. 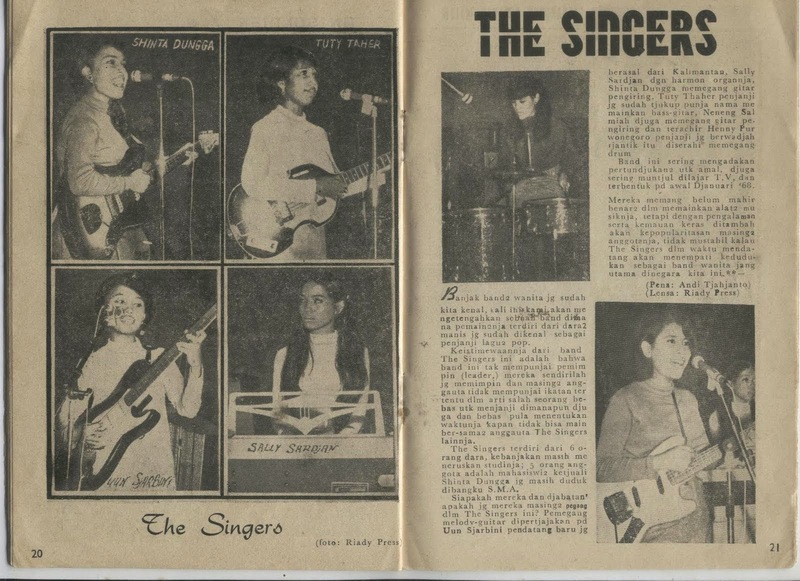 The Singers were an all-girl garage band that started 1967, one of the few along with the better-known Dara Puspita (who will appear on the next Indo comp) and others like Yanti Sisters, The Beach Girlsa and Sitompul Sisters. They were Tuty Thaher (bass), Sally Sardjan (organ), Henny Purwonegoro (drums) and Shinta Dungga (guitar). The Ballad "Oh Tuhan" [Oh Lord] is a delightful adaptation of "House of The Rising Sun" and makes for a nice mellow break in proceedings. 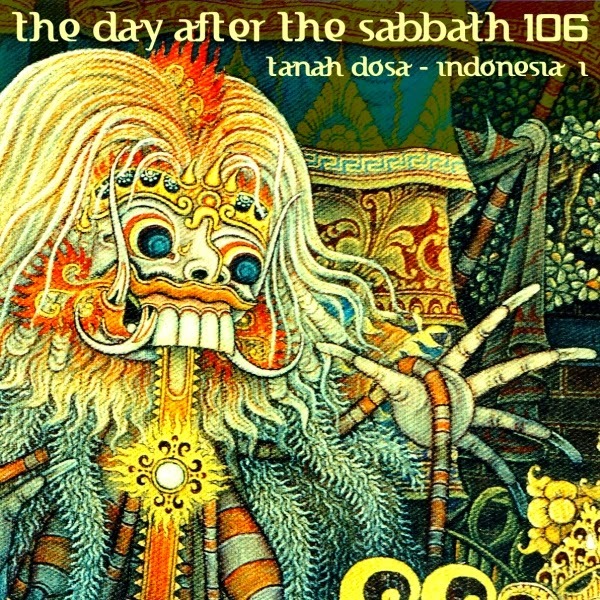 One of their garage tracks "Hand of 1000 Dances" was used on the compilation "Java-Java: Indonesia Screaming Fuzz, Garage Stomp, Indo-Rock, Beat Surf Vol. 2"
13. God Bless only made one album in the '70s, but it's one of the best. Similarly to Shark Move and Giant Step, which it had strong ties to, the music was very much influenced by Deep Purple's organ-heavy prog. 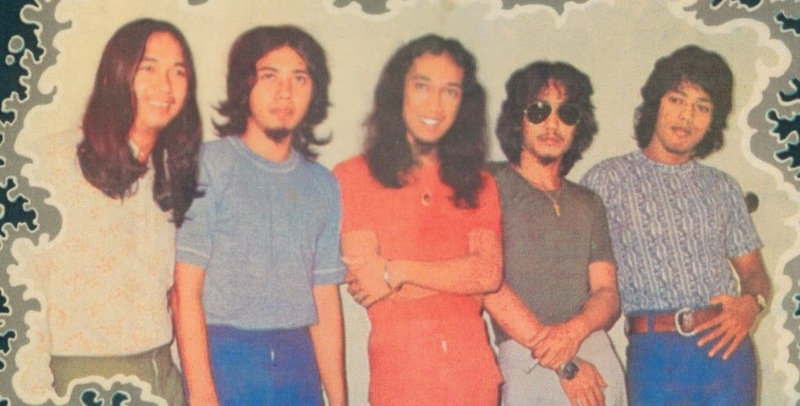 God Bless counted these familiar names amongst its ranks at various times; Soman Loebis, keyboards 1973-74 (Shark Move, The Peels), Achmad Albar, vocals (Duo Kribo), Deddy Dores, keyboards 1973 (Giant Step, Superkid, Freedom Of Rhapsodia, Deddy Stanzah band) and Yockie Suryoprayogo keyboards, 1973-76, 1988-2002 (Giant Step, Contrapunk). As one of the only bands up to the job, they were selected to support Deep Purple's show in Jakarta in 1975, a show which had some tragic consequences. They were more active in the '80s and have issued albums sporadically up to 2009. They have appeared on stage as recently as July 2011.